The pretty bell tower of this 1956 church sticks its head up between the lush trees of pleasantly suburban Yarmouth Road in North Lowestoft. The ancient village name is a courtesy title really; this church is as close to the centre of Lowestoft as the Borough parish church of St Margaret, and it is hard to see that there was ever a village here. There probably wasn't; Gunton Hall, with the pretty round-towered medieval parish church of St Peter, lies some way to the north of here, and the hall grounds are now the home of the American theme park Pleasurewood Hills, Suffolk's biggest tourist attraction. The church is quite a large one for its age. 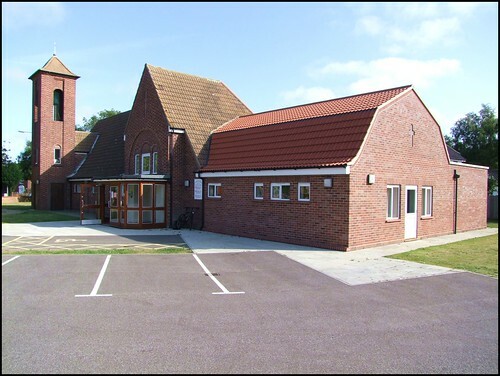 It was designed, like nearby Oulton Broad St Luke, to be both a parish hall and a church. Since my last visit ten years ago, a new extension has been added to the western end, doubling the building in size. The red brick and pantiled roof of the old part give it a metroland air, quite in keeping with the Yarmouth Road bungalows and houses of twenty years earlier. The bell and the dedication are here because of the German bombing of the city of Norwich during the Second World War. The church of St Benedict there was gutted in the Blitz. After the war, the Diocese of Norwich used the war damage reparation money to build a new church here instead. The bell is from the former Norwich church; but if you ignore the tower, the older part of the church looks as if it might actually be a large house, because of its slightly unnerving 1950s domestic windows. You step inside to a large entrance area, turning left into the original church. As at St Luke, the body of the church is divided from the sanctuary by a screen. The interior, with its red flush curtains and red modern seating, is reminiscent of a small cinema. It is all pleasantly understated, unlike the blousy neighbouring Mormon church, with its hi-tech spire. Incidentally, although St Benedict matches architecturally its leafy surroundings, it isn't here to serve them. Behind it, Hollingsworth Road is the spine road of the large and challenging Gunton estate, a high density 1960s housing development built for workers in Lowestoft's many factories of the time. Unemployment and poverty have taken their toll, and you hope that St Benedict has been the root of some comfort. And it is good to think that the bell which rang out over the medieval tenements of Norwich workers now sounds across the houses of their modern counterparts.